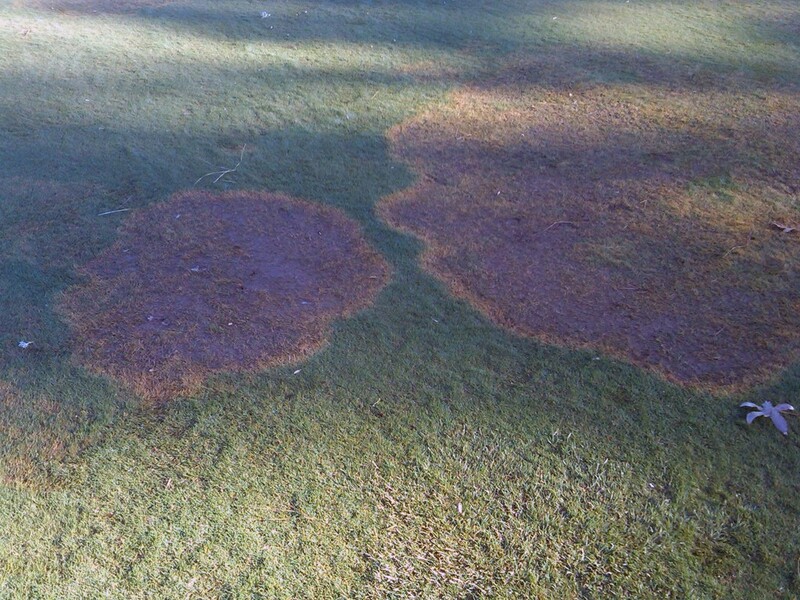 Brown patch is a major summer disease of lawns and golf courses. The most susceptible grass species include perennial ryegrass, tall fescue, and the bentgrasses. 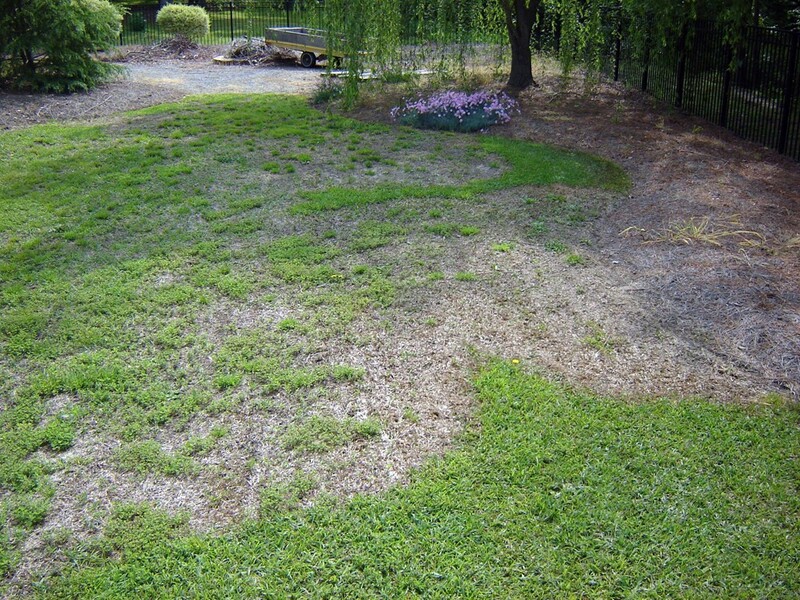 Occasionally, brown patch becomes a problem on Kentucky bluegrasses in mid- to late-summer during extended periods of high temperature and humidity. On high-cut turf, patches may be up to several meters in diameter and circular. In early morning on dew-covered turf, white mycelium of the causal fungus can often be seen on and between grass leaves and stems in the patch. Sometimes, all the grass within the patch is killed, creating a sunken or “pocket” effect. More often, the turf in these patches is thinned rather than completely killed. Occasionally, no circular pattern can be seen, and disease appears as a diffuse blight. 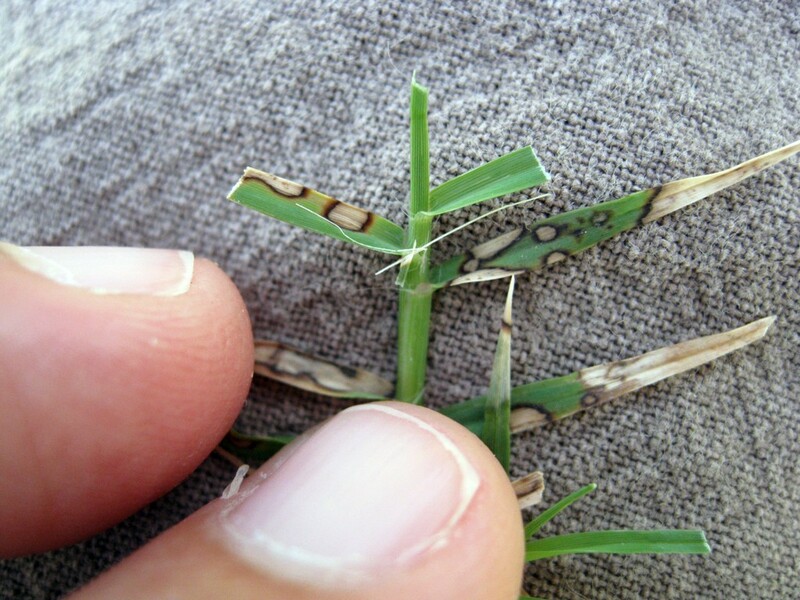 On tall fescue, symptoms of brown patch can be observed on individual leaves and not necessarily in patches. Symptoms on leaves appear as irregular tan or light brown lesions surrounded by dark brown borders. In severe cases, the entire stand may look discolored and thinned. A distinguishing feature of brown patch on golf course putting greens is the presence of dark purplish rings around the periphery of the patches. These are called smoke rings and range from 6-13mm wide. Smoke rings are more pronounced in the early morning hours, usually fading by midday. The causal fungus overwinters in the form of resting bodies called sclerotia, either within infected grass tissue or in the soil. The fungus is capable of surviving in soil for years in the absence of a susceptible grass. Disease activity is prevalent when surface moisture and humidity are high, night temperatures are above 20°C and daytime temperatures average 27° C or above. Rainy weather and a saturated atmosphere (100 percent relative humidity) greatly speed disease development. Disease severity is greater on lush, succulent turfgrass maintained with high nitrogen levels than on grass maintained with moderate levels. Applying nitrogen fertilizers on turf with a known history of brown patch during hot and humid weather may create the need for fungicide applications to control the disease. Removal of dew or guttation water that collects on the grass leaves each morning has proven effective as an aid in reducing brown patch. This removal can be achieved by mowing or by dragging a water hose across the area. Necesary watering should be done in time for the grass to dry before nightfall. Fungicide treatment should only be needed on high-value ryegreass or bentgrass turfs. Fungicide treatment usually is made on a curative basis; the first spray should be applied immediately after the onset of symptoms, especially if prolonged hot, humid weather is expected. In areas where brown patch causes severe thinning on putting greens, preventative fungicide applications may be justified.